Save Tin Pan Alley, Before it's Too Late! We are petitioning NYC Landmarks Preservation Commission Chair Sarah Carroll, NYC Councilman Corey Johnson and Mayor Bill de Blasio to Landmark Tin Pan Alley before it disappears. 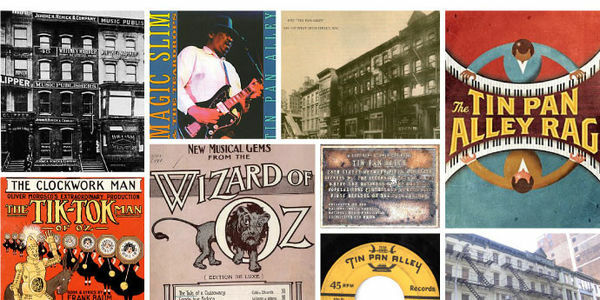 From Irving Berlin to Scott Joplin, Fats Waller to Cole Porter, the composers and lyricists of Tin Pan Alley wrote the songs that defined American popular culture from the late-1880s to the mid-1950s. Beginning as early as 1885, music publishers flocked to this singular block, on West 28th Street between Broadway & 6th Avenues in Manhattan, to set up shop. A number of the structures that housed these creative agencies still remain including the buildings at 40-42 and 47-55 West 28th Street. Yet despite their undeniable significance, these properties sit unprotected and vulnerable to development and real estate pressures. Some of the most significant buildings at 47, 49, 51, 53 and 55 have been on and off the market for several years now, marketed as a huge development site of more than 111,000 square feet of prime real estate. The demand for hotel development sites has skyrocketed, and demolition of small buildings in the area to combine into large parcels for development has increased drastically year by year. As a consequence, all of the remaining buildings that constitute Tin Pan Alley– 45, 47, 49, 51, 53, and 55 West 28th Street, have been sold as a parcel to a real estate developer. Because of the large size of the parcel and the buyer&apos;s experience in New York City real estate development, it is likely that all of Tin Pan Alley will be demolished to make room for high-rise development in the near future. If this happens, Tin Pan Alley will cease to exist. This is no way to treat America&apos;s irreplaceable cultural history. The preservation of these row houses is long overdue and now it&apos;s time for the New York City Landmarks Preservation Commission to preserve these important structures for generations to come. Thank you for your support in our efforts to preserve Tin Pan Alley! In Dec. we had an excellent meeting with the NYC Landmarks Preservation Commission, elected officials, and renowned historians to advocate for the creation of a Tin Pan Alley Historic District. Let’s Save Tin Pan Alley in 2018! CELEBRATE AND SAVE TIN PAN ALLEY WITH AN AFTERNOON OF FREE PERFORMANCES, TOURS, EXHIBIT AND MORE! Enjoy musical performances beginning at 2 pm and take a tour at 2:30. Rally to protect the very location where composers and publishers created the American popular music industry at the turn of the 20th Century.